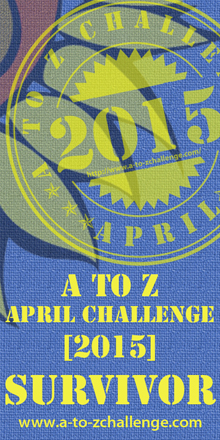 I'm almost positive I've used NaNoWriMo as my "N" post in a previous A to Z Challenge (Yep! A to Z 2014), but it's literally the one writing event (besides this very A to Z Challenge) that I look forward to every year. Maybe a few annual writing contests, but I never get anything written for them on time, if at all. If unfamiliar, NaNoWriMo is a yearly writing challenge of writing 50k words throughout the month of November. That comes out to roughly 1667 words a day or so, if I recall correctly. I've had some decent years, some not so decent, but only one official "win" since I began participating in 2012. However, I consider any writing a win! And these past two years (maybe just last year?) I've focused much of my NaNoWriMo time to a board game I'm working on. Like the A to Z Challenge, most of the month is spent solely trying to write (generally on multiple projects) and my social life really takes a blow. I write slow, so for me to just sit down for an hour or two a day, knocking out 2k words, isn't exactly a reality. I try to put my priority on writing, though, it's a habit (many would agree is unhealthy) that I fall into year after year. I think that's because it's one of two challenges that actually inspire me to write, even if I don't finish. Have you ever participated in NaNoWriMo? If so, what have your experiences been like? Are you participating this year? If so, do you have an idea and/or outline of what you'll be writing? What's some advice you would give to newcomers of the writing challenge?